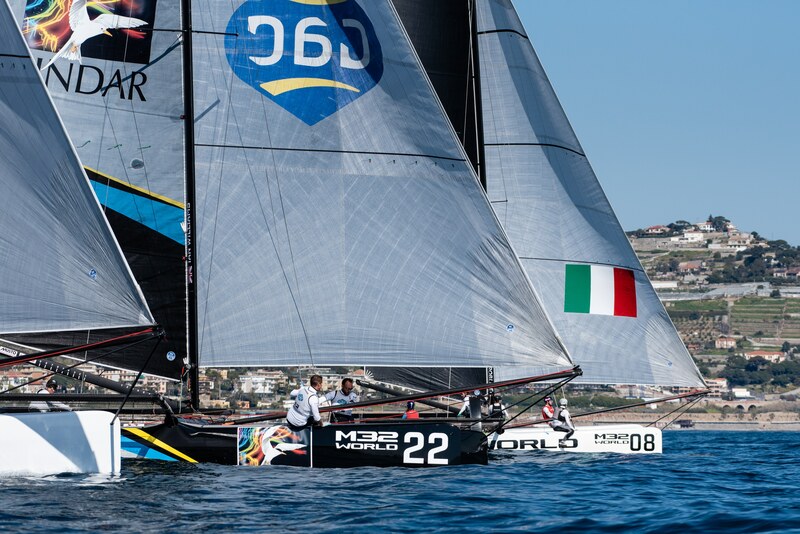 The nimble M32s came into their own on the first day of the San Remo warm-up event for the M32 European Series, when the featherweight one design catamarans were able to pick themselves up and provide fair, even exciting racing in just four to seven knots of wind. Forecasts for today varied from two to 22 knots all from the east or northeast. In the event, following an hour’s delay, the wind began to fill in from the southwest, racing getting underway in a marginal four knots. In fact, with crew perched on the leeward bows to minimise drag, this was more than enough to provide good racing. Defending M32 European Series champion Ian Williams’ GAC Pindar nosed ahead off the line and led around the reaching mark as the five M32s set off on the windward-leeward course with reaching starts and finishes. Wind coming good on different parts of the course saw GAC Pindar’s lead threatened initially by the Daniel Bjørnholt-helmed Youth Vikings Denmark, subsequently relegated to third by Håkan Svensson’s Cape Crow Vikings, on which young Swedish match racer Nicklas Dackhammar is standing in on the helm as the Aston Harald boss recovers from a hand injury. For race two the wind picked up by a couple of knots and evened out across the course. This transformed the racing with boats suddenly flying hulls, even downwind. 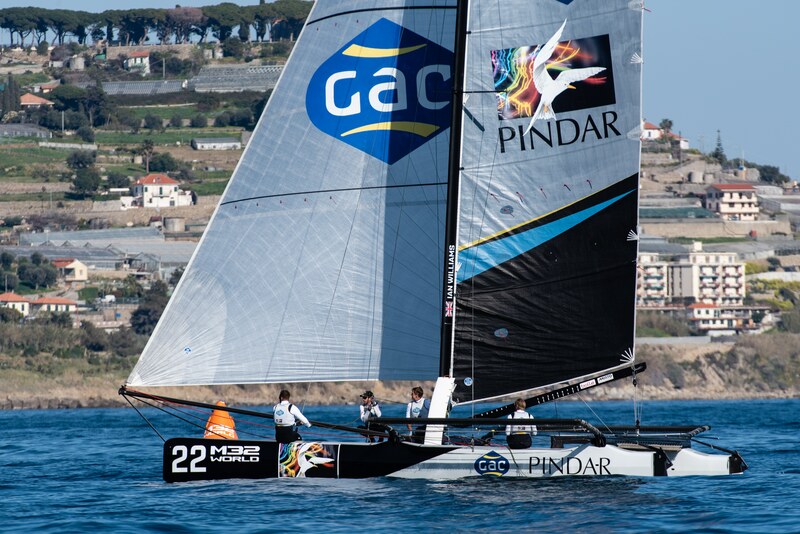 In this GAC Pindar once again got the best start, followed down the run and into the leeward gate by Youth Vikings Denmark, but for the British six-time Match Racing World Champion and his crew, their victory was never particularly threatened. Last in the first race Shark Team, skippered here by Italian Andrea Vacchino, made a better start to hold second place to the finish. With Cape Crow Vikings helmed by the present World Match Racing Tour leader Nicklas Dackhammar, it was only a matter of time before the rising Swedish sailing star would show his true colours. This occurred in race three, the windiest of the day with 9-10 knots in which the boats were furling their gennaker upwind. A start on the button to leeward allowed Dackhammar and his Cape Crow Vikings to lead down the reach and on to the run. Despite GAC Pindar keeping it close, they managed to hang on from there. Thus the boat that was last in race two won race three. “It was really tight,” said Dackhammar afterwards. “We had a good start gaining some metres on the other boats and then a good first downwind and the first upwind was pretty close. We ducked Shark Team and Ian got really close to leeward at the last upwind mark, but then we got ahead again and held the lead from there to the finish. Trying their hand at catamaran racing for the first time at this event is Richard Göransson’s Inga Racing Team, best known for competing in the Melges 32 and 40 classes. 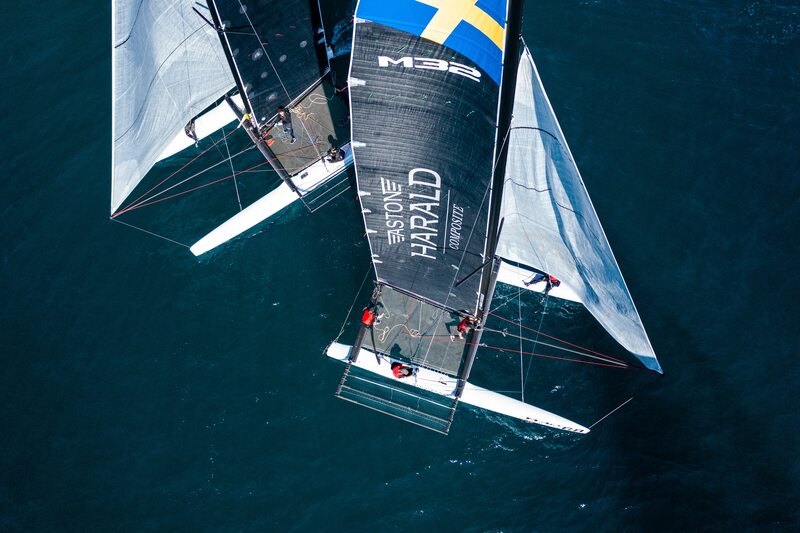 They had already experienced highs and lows during the day including their young Olympic Nacra 17 catamaran sailor crewman Emil Järudd falling off the slippery bow into the water while hardening up after a leeward gate rounding in race three. 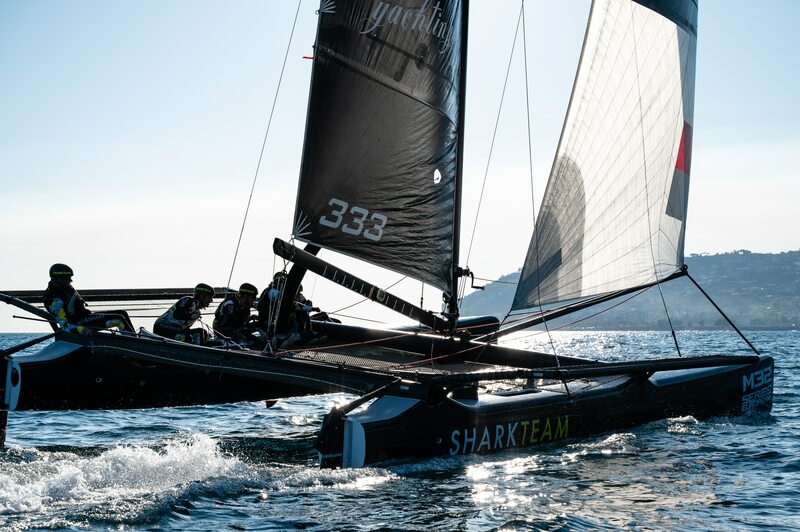 They finished last in that race, but like the Cape Crow Vikings in race three, turned this around to score their first race win in the fourth and last race, on their first ever day of multihull racing. 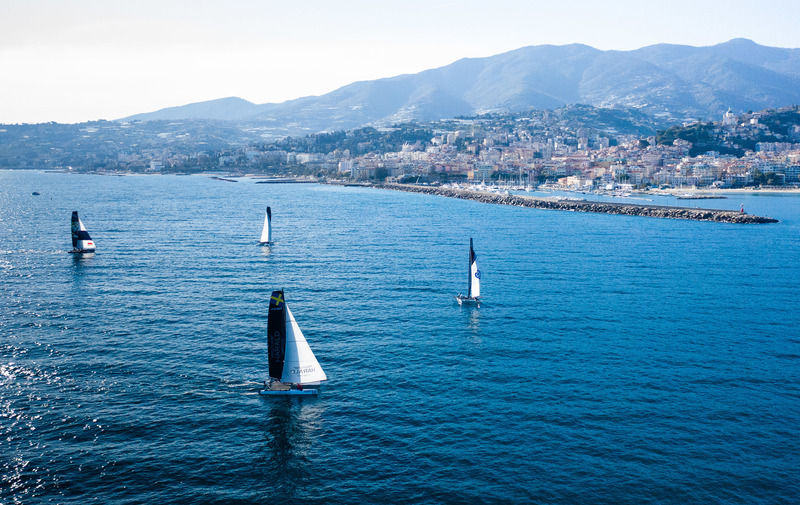 Racing on day two of the M32 European Series warm-up event here in Sanremo, Italy will start at 1300, an hour earlier than today. From leisure sailing to professional racing on a global stage, there is an M32 designed for every type of owner. Step in to the M32 World and experience our passion for the most exciting high performance multihull on the market. See our portfolio of events from around the world including the America’s Cup race course in Bermuda to iconic city locations such as Stockholm in Sweden to Perth in Australia. ©2019 M32 World · Built with love by Adstream.